I like elevation, I do. The monotony of continual flat running, for anything over marathon distance, is a mental challenge to which I rarely look forward. So I lean towards races with some climbing. This breaks up the run and forces you to walk giving you natural rests in between efforts. The problem with Round the Rock on Jersey, as with its baby sister the GU36 on Guernsey, is that at some point in the long forgotten past, someone decided that people couldn’t go up an incline without steps. So the same person, probably, took it upon themselves to build sets of steps into every uppy, downy bit around the entire coastline of Guernsey and Jersey, and no doubt Alderney and Sark too. When is the Sark 100 miler by the way? My uncle lives in Jersey, so running Round the Rock was a lovely opportunity to stay with him and meet two cousins of mine for the first time. The flight on Easyjet from Gatwick is 40 minutes. Can you believe they try and sell you duty-free, drinks and snacks in that time? Jersey is a lot more built up than Guernsey. St. Helier feels like a proper big town, whereas St. Peter’s Port feels like a quaint Cornish town. Tourism has been overtaken by Finance as the primary source of Jersey’s GDP, so there are numerous shiny, steel and glass corporate buildings popping up all over St. Helier. Round the Rock is a well-established ultra, now in its 8th year. Previous winners have included Steve Way and Paul Martelletti. Paul is famous for his super-speedy Spiderman run at the London Marathon. There’s a hilarious video of him running past Paula Radcliffe in his Spiderman suit. He’s also won Brighton Half Marathon in the past. Paul also holds the record for completing Round the Rock, of 5:42 minutes. My ambitions were somewhat less lofty. If you can finish Round the Rock in under 8 hours you get a gold medal. If you complete in under 10 hours you get silver. Over 10 hours is bronze. I was confident I could probably grab a silver medal. Registration and the race briefing took place the night before at the Radisson Blu hotel near the start line. Digby’s main focus was to ensure we looked out for the four horned sheep and the Red-Billed Chough, whilst traversing the northern coast of the island. Other than that the rule is, keep the sea on your right and you’ll be fine. 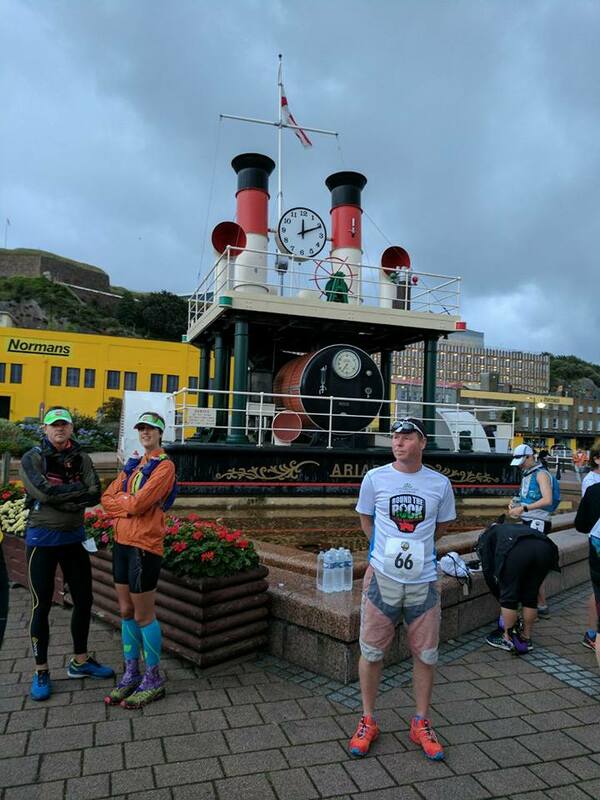 Start time was 6am Saturday, at the Steam Clock in St. Helier. Apparently, the clock hasn’t actually worked in all the years the race has been running. It was actually raining briefly just before we set off, but once we were underway it didn’t take long for the sun to make an appearance. The first 13 miles of Round the Rock is a tarmac affair. It’s flat for 10 miles and you have to be careful not to go off too fast on this section because there’s a lot of elevation to come and you don’t want to have shot your load on the road. At 8 miles in you get to the very pretty Gorey Harbour and the impressive Gorey Castle. For a brief moment you think you’re leaving the road but after a brief climb around the side of the castle, it’s back on tarmac for the run to the first aid station at St. Catherine, on the north east peninsula. Along with the solo runners doing the full 46-48 miles, there were a lot of runners taking part in the team relay. So there were lots of people waiting at St. Catherine to greet us as we rolled through. I had hardly touched my water supplies so I didn’t stop. From here you stay on the tarmac for a few more miles, but it starts to get hilly. At 21km the real trail running begins as you finally leave the road and head out over the cliffs. This is the toughest, most technical part of the run, along the north coast. Down numerous sets of steps, crossing streams in the valleys and passing through small hamlets before climbing endless steps back up to the top. I’m making it sound traumatic but it’s very beautiful, as you will see if you watch the film. The views are terrific. The beaches are pristine and the water is turquoise. The grass is lush, the cliffs are impressive and the numerous World War Two German machine gun turrets are well preserved and mighty. Just over 33km in, around 21 miles, is the ‘half way’ aid station at La Fontaine. This is where you have access to a drop bag. I would say the food selection available at all the aid stations is minimal, but there is no suggestion in the race information that you are going to be catered as though at a Centurion event. This is minimalist ultra running. If you want a ton of sandwiches, chocolate and muffins, you’ll have to carry it yourself. The race is cupless to a point. After the first aid station water is not supplied in cups. It is not poured out ready and waiting for you. You can have your hydration system topped up and the volunteers were amazing doing that job. Coke is available which the staff at the aid stations will pour out for you. I’m looking forward to the day when all ultra races in the UK stop supplying drinks in cups. I now carry my own collapsible cup and it’s really not a problem to spend 5 seconds filling your own cup at a checkpoint. The cliff running continues for another 10 miles along the north coast to the third aid station at Grosnez and round the north west headland. At Le Pulec there’s a steep drop down to the start of Five Mile Beach. In all the documentation for Round the Rock, the race is listed as being 48 miles long. However, with full consent from Race Director, Digby, at this point runners have the option of shaving distance off by cutting across the beach. You can, of course, stay on the marked course on the road round the bay. But let’s face it, the beach is so much nicer. At the slipway on to the beach, there are in fact two arrows. One pointing to the road and the other to the beach. I am getting a bit of a reputation for jumping in water at every opportunity whilst on long trail runs. It started at the Grim Reaper Ultra when I swam in the lake in 2015. I did it again in 2016 and now, every time I see an opportunity, I’m in! I jumped in the sea in Guernsey during the GU36 and half way across Five Mile Beach I stripped off and absolutely loved getting in the sea. If you are not gunning for a fast time and you suffer in the heat, I heartily recommend swimming to cool your muscles off and relax you. There were people who passed me as I was swimming, but with the energy gained from my dip, I soon caught them once I got running again. Once you finish the northern cliff section, some might tell you that the hard work is done. There is some truth in that, but don’t for one minute believe that it’s plain sailing to the finish. The flat beach sections are tough because you feel obliged to run. There are still plenty of sets of steps and plenty of climbing still to do. At the end of Five Mile Beach is the south west headland at Corbiere. Lots of climbing, lots of steps to get to the final aid station at Beauport and then the beach at St. Brelade’s with 8 miles to go. This is a popular tourist beach and you may get some odd looks as you trudge across the sand. Depending on what time you arrive at St. Brelade’s you may be in luck with the tide. If it’s out, you can run straight across the beach. If it’s in, your path is cut off by rocks that jut out and you’ll have to go up and over. I jumped in the sea again here and could see the 10 hour finish time slipping away. However, for me, the importance of enjoying my run and the experience outweighs the need to finish in a certain time. Of course, filming a race also adds time. When I’m filming it’s more important to me to get decent footage rather than bang out a decent time. If I can do both, great, but more often than not I have to sacrifice running fast for the sake of the film. There’s another headland after St. Brelade’s before the drop down to St. Aubin and the final beach run home. I crossed the finish line at La Fregate in 10 hours 7 minutes and 50 seconds. I sat on the grass with my bronze medal around my neck drinking a latte from the cafe and eating a lolly in the late afternoon sunshine. There’s a free beer at the end if you drink alcohol so that’s a nice little carrot for some people. Marathon/ultra number 69 in the bag and another beautiful day in the sunshine to remember. And that’s what it’s all about. Creating memorable experiences. Seeing parts of the world you’d never see otherwise. 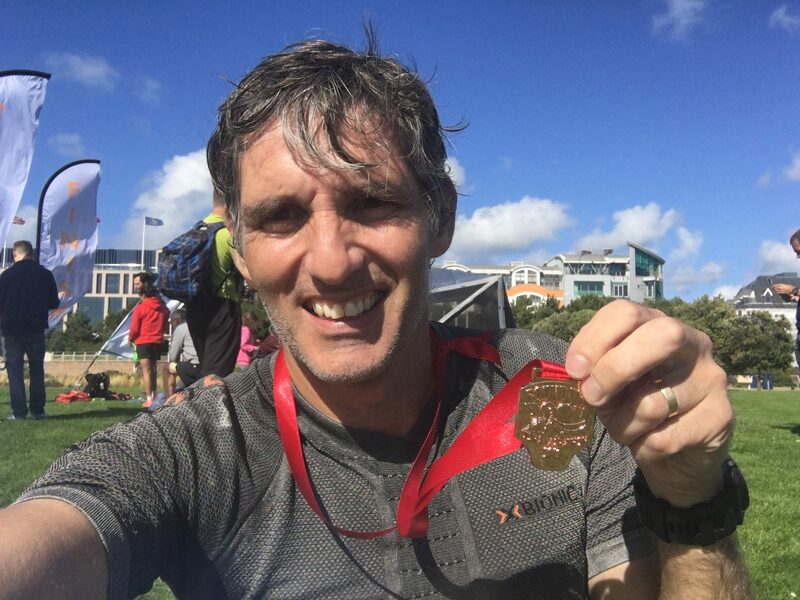 Reaching extremes of emotion and physical exertion and having that sense of accomplishment and satisfaction that comes with finishing a race like this. If you ever get the chance, do go to the channel islands and do both the Guernsey GU36 and the Jersey Round the Rock ultra. Round the Rock is certainly a challenge, but by no means an insurmountable one. The distance is perfect for those looking to go long but with limited experience. For those who know what they’re doing it’s still a decent challenge with a good amount of gain, lovely scenery and varied terrain. In fact, it’s a very interesting race from a terrain perspective. There’s the flat, fast roads at the beginning. Some of the cliff running is really quite technical and then there are three long sections of beach. If you run all the beaches you can cut the full 48 mile distance down to 46 miles. However, the seeming benefit gained by reducing the advertised distance is negated when you look at the advertised elevation and realise you’ve actually climbed around 600-800 metres more than the 1000 metres listed on the website! When I finished, my watch said 74 kilometres and about 2500m of ascent. When I used Strava to correct the elevation using its known barometric information it came out at around 1800 metres. So on the film, I am being generous when I say it’s 1600 metres. Whatever the true elevation, it’s surely way more than Digby’s 1000 metres! Cheeky monkey.